Dusty sites; infestations especially begin along field edges adjoining dusty roads and in surface-irrigated fields. 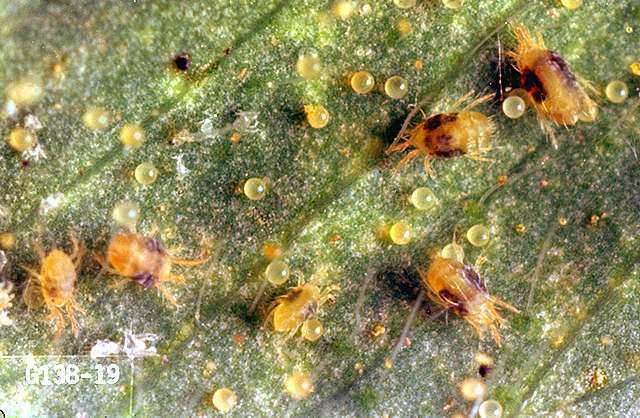 Excessive use of foliar-applied insecticides (especially pyrethroids and organophosphates) directed at aphid or pests other than spider mites, but which also kill mite natural enemies and so allow spider mites to increase without checks. Hot, dry weather that enhances mite survival and reproduction; short generation times and multiple generations allow explosive increases in spider mite infestation levels. Weedy fence rows and ditch banks where mites overwinter. Scouting and thresholds No formal economic thresholds exist for spider mite insecticide treatment decisions. Beauveria bassiana (BotaniGard ES, Mycotrol ESO - live spores of an insect-killing fungus)-See label for rates. PHI 0 days. Typically requires 7 to 10 days after first spray to see control. Begin treatment at first appearance of pest. Reapply as necessary. OMRI-listed for organic use. azadirachtin/pyrethrins (Azera) at 0.0125 to 0.025 lb ai/a, and up to 0.044 lb ai/a under extremely heavy infestation. Dilution in a minimum of 30 gal of water per acre is recommended for conventional equipment. May be applied by air at the rate of 0.0125 to 0.025 lb ai/a in a minimum of 25 gal of water. Do not repeat more than every 5 to 7 days. chlorpyrifos (Eraser, Govern 4E, Lorsban 4E, Lorsban 75WG, Nufos 4E, Pilot 4E, Warhawk, Whirlwind, Yuma 4E, and others) at 0.5 lb ai/a broadcast application -or- Lorsban Advanced, Vulcan at 0.469 lb ai/a broadcast application. PHI 30 days. Do not let livestock graze in treated areas or harvest treated beet tops as feed for meat or dairy animals within 30 days after last treatment. chlorpyrifos (Eraser, Govern 4E, Lorsban 4E, Lorsban 75WG, Nufos 4E, Pilot 4E, Warhawk, Whirlwind, Yuma 4E, and others) at 0.33 lb ai/a band application -or- Lorsban Advanced, Vulcan at 0.313 lb ai/a band application. Apply as 5- to 7-inch band, lightly incorporated mechanically or with irrigation. hexythiazox (Onager and Ruger 1EC) at 0.094 to 0.188 lb ai/a. PHI 45 days. Do not make more than one application per calendar year. kaolin (Surround CF) at 5.94 to 11.88 lb ai/a. For suppression only. Product forms a barrier film that acts as a protectant; apply before infestations develop and continue on a 7- to 14-day schedule for the duration of the infestation. naled (Dibrom 8 Emulsive) at 0.94 lb ai/a. REI 48 hr. PHI 2 days. Do not apply more than 4.7 lb ai/a per season. neem oil (Neem Pro 100%, NimBioSys)-See label for rates. REI 12 hr. OMRI-listed for organic use. At planting-Apply at 0.68 to 0.9 oz ai/1,000 row ft. PHI 30 days. Drill to side of seed or band over seed. Do not feed tops or silage to dairy cattle. Do not place granules in direct contact with seed. Only one application per cropping season. Postemergence-Apply at 0.975 to 1.5 lb ai/a. PHI 30 days. Apply to foliage when plants are dry. Only one postemergence treatment per season. Do not feed tops or silage to dairy cattle. Do not place granules in direct contact with seed. Only one application per cropping season. potassium salts of fatty acids (Des-X, Kopa, and M-Pede)-See label for rates. PHI 0 days. Some formulations are OMRI-listed for organic use. potassium silicate (Sil-Matrix) at 1.5 to 3 lb ai/a. For suppression only. Do not apply more than 21 lb ai/a per season. PHI 0 days. OMRI-listed for organic use. soybean oil/garlic oil/capsicum oleoresin extract (Captiva)-See label for rates. PHI 0 days. REI 4 hr. sulfur (too many commercial products to list all trade names here)-PHI 0 days. Rates depend on formulation. Some formulations are OMRI-listed for organic use.